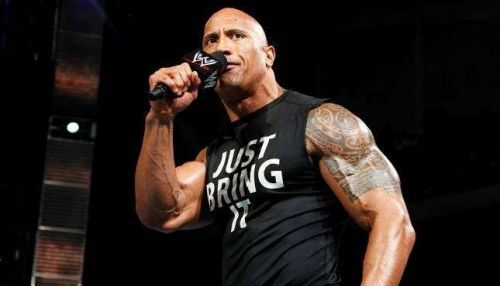 WWE icon The Rock aka Dwayne Johnson has taken to his official social media account, in order to address the 17th anniversary of his legendary WrestleMania 18 match against Hulk Hogan. While The Rock opened up on 17 years having passed since the memorable clash between "The Brahma Bull" and "Hollywood" Hogan, the former also revealed who he thinks are the GOATS (Greatest Of All Time) in the WWE. One of the most important matches on the WrestleMania 18 card was a singles matchup -- billed as "Icon vs. Icon" -- featuring The Rock going up against "Hollywood" Hulk Hogan. The matchup lasted around 16:23 minutes, and turned out to be one of the most awe-inspiring professional wrestling contests of all time -- which was further magnified by the incredible reactions from the hordes of fans in attendance for the event at the SkyDome in Toronto, Ontario, Canada on March 17th, 2002. After a grueling back and forth affair, The Rock finally managed to score the pinfall and defeat Hogan -- Following which, Hogan's nWo stablemates Scott Hall and Kevin Nash turned against Hogan and attacked him. Rocky then came to the rescue of Hogan, and the duo ended up standing tall while Hall and Nash were forced to retreat. One ought to note that The Rock and Hulk Hogan's aforementioned matchup is widely regarded as one of the most historically significant clashes in professional wrestling history -- particularly since The Rock and Hogan managed to play to the crowd, and adapt to changes in the fans' reactions in real-time, changing the match's momentum based on the fans' response. The Rock took to Instagram, and shed light upon the fact that it's been 17 years since the aforesaid showdown at WrestleMania 18 (March 17th, 2002). “It was almost as if every single person that night in the Toronto SkyDome made up their mind that they would give every ounce of energy they had because they knew this match was only going to be seen once in a lifetime. The Rock continues to make sporadic appearances in the WWE, however, he's lately been busy with his Hollywood obligations. Meanwhile, Hulk Hogan returned to the WWE last year, and was reinstated into the company's Hall of Fame. On the other hand, Ric Flair and "Stone Cold" Steve Austin too, appear on WWE programming and events from time to time. Who do you consider the GOAT/GOATS of WWE? Sound off in the comments!